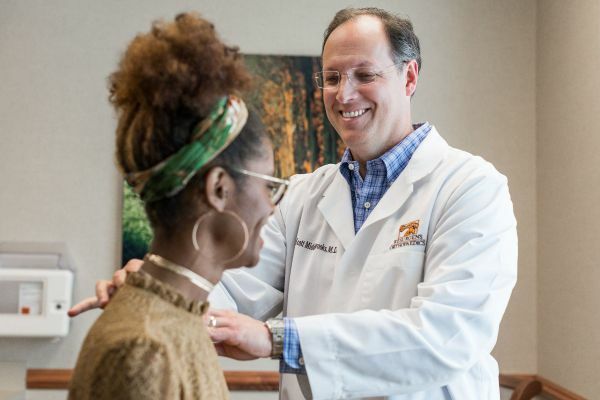 Our board-certified physicians are experts in the diagnosis and treatment of patients suffering from neck and back pain, and can offer both surgical and non-surgical treatment options. Resurgens Spine Center is committed to providing the highest quality spine care to all of our patients in treatment of all spine conditions. Using clinical protocols and utilizing the latest technology, we strive to provide the right treatment at the right time for each patient. Our goal is to empower the patient with the tools that will assist them in returning to their highest level of function. Our physicians and specialists use the latest technology such as MRI, CT, and myeologram, as well as other tests including discography, EMG, and nerve conduction studies to diagnose your back and neck pain. Our physiatrists (non-surgical spine physicians) work with each patient to determine the best treatment options to help you reach your goals. These non-surgical procedures include epidural steroid injections, facet joint injections, nerve blocks, and other pain-relieving procedures. Our neck and spine surgeons are trained to perform the latest spine surgery techniques including minimally invasive surgeries (MIS) and motion-preserving technologies such as artificial disc replacement. Our spine therapists, some of the most well-respected in Georgia, have advanced training and expertise in spine rehabilitation and work closely with our spine physicians to ensure that each patient is returned to the highest level of function and pain relief possible. Our doctors answer your questions so you know what to expect before your visit and throughout your diagnosis and treatment. Find a Spine Doctor near you. "The Resurgens team was so wonderful during the entire process." "The staff at Resurgens is second to none. The quality of service was incredible." Castillo became a patient of Resurgens Orthopaedics after he moved to Atlanta in 1984. "As a nurse, I probably did more research to find a doctor than a lot of people would"
"I do yard work, I even used a tiller—things I used to do before I hurt my back."